If you’ve passed through the intersection of Santa Monica and La Brea in the past year, you likely noticed a swirl of activity. New buildings have popped up and old buildings have been knocked down. Vacant storefronts are being filled with new retail outlets while the formerly clustered and closed bus stops have been given a delicate revamp. Some of the most subtle updates are more colorful: new plants line the sidewalk while a thin median of young trees divides Northbound from Southbound traffic. These green additions caused months of hiccups for pedestrian, bike, and car traffic due to construction, but ultimately brought a calm to the intersection. 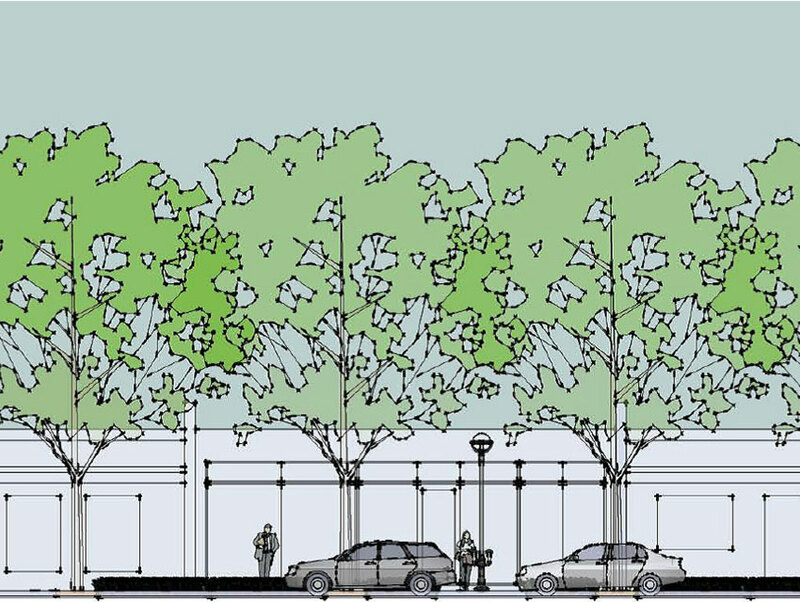 This is the La Brea Streetscape Project, an initiative to improve the avenue from Fountain to Romaine. The upgrades in the area have prevented suicide lane congestion and allow more room for people-moving buses to weave in and out of traffic. The biggest win is for pedestrians, though, who now have shade and a proper boundary between walkways and driveways, and another reason to head outside. It’s a laudable effort. The La Brea Streetscape Project is so well executed that it just won the American Society of Civil Engineers’ Community Improvement Project of the Year for Los Angeles. Yes, the change only affected three-ish blocks of the entire city, but it is something we can learn from; it is inviting to pedestrians, features water-efficient greenery, and was pulled off–fast. The La Brea Streetscape Project also illustrates how a little goes a long way, and how stopping and thinking about shared spaces benefits the city. With all the new residential developments popping up in that area, this was an especially wise marketing move. It shows anyone who doesn’t live in the area that you can go to La Brea and Santa Monica and walk around, exploring the area for an afternoon. Now, of course, the effort isn’t perfect. Again, we’re talking about just a few blocks here, and the attractions in the area—a Target, a rent a car dealership, vacant apartment buildings—have yet to truly entice. But! The potential is there. What the La Brea Streetscape Project did is think laterally to create a space that functions as well for pedestrians as cars and buses. That, friends, is what makes a city street special.